Dragon Ball Super Vol. 3 Review – AiPT! Trunks, Goku, and Vegeta go back to the future to face Goku Black in the latest action-packed volume! Dragon Ball Super Vol. 3 features origin stories for Zamas, the apprentice to Universe 10’s Lord of Lords, and the current antagonist, Goku Black. Goku, Vegeta, and Future Trunks begin to plan their attack on Goku Black in Future Trunks’s past, but does the volume juggle the time-hopping action well? The strongest aspect of Akira Toriyama’s scripts is the way they balance heaviness and humor. 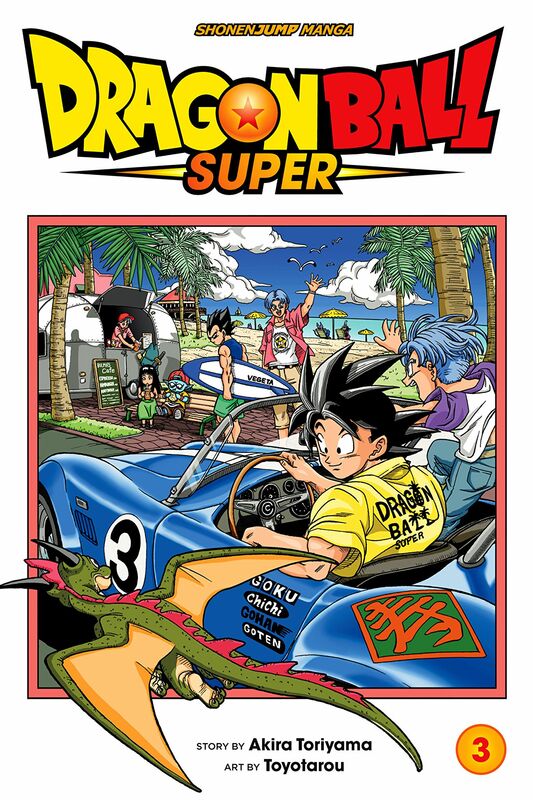 Only in Dragon Ball will you finish reading several pages where characters discuss the futility of mortal life and its ceaseless conflicts in spite of culture and evolution, then turn the page to see the Saiyan gang playing a very Mario Kart-esque video game with a God of Destruction. The cuts to funny scenes of gaming or Vegeta hollering at “Kakarot” keep the series from feeling like it takes itself too seriously, even when there’s talk of eliminating every mortal being in existence. Beerus can destroy a planet by pointing a finger and he has, but instead we see him breaking his Wii U-esque gamepad out of frustration from losing to a grade-schooler. Speaking of Beerus, he steals every scene he’s in and is my favorite addition to the cast since the beginning of Super. His regal feline appearance and diva personality keep me laughing and make me wish he had more page time when he’s left out of a scene. Those Beerus-less scenes fill most of the second half of the volume as Goku, Vegeta, and Future Trunks go back in time to fight Goku Black, the villain who has taken Goku’s appearance and wiped out everyone in Future Trunks’s past. I’ve never expected the most gripping of plots from Dragon Ball and this volume of Super is no different. The reveal surrounding Goku Black’s identity is easy to figure out several chapters before it happens, and even with the timeline-hopping the plot is very simple. The story really only moves forward through characters taking turns duking it out until someone loses and is replaced by someone stronger. Again, fans of Dragon Ball probably aren’t expecting a plot rich in intrigue and suspense, but readers who are new to Dragon Ball and looking for a deeply compelling story should look elsewhere. This volume, as with every volume of the series, shines through the personality of the characters and outrageous fights. That personality and character comes through in large part due to artist Toyotarou’s animated, uplifting style and execution. Goku continues to be the cutest DILF in manga thanks to Toyotarou’s restraint in adding more lines than necessary to a panel. The character renderings favor personality over detail, letting characters’ expressions stretch out their faces to a comedic extent. It makes a strange amount of sense that Zenô-sama, the lord of all universes, is one of the most low-detail characters and looks like a wind-up toy from a Katamari game. During the more serious fights, Toyotarou lets the brows furrow and adds lots of sparks and glow to convey which level of Super Saiyan the characters are fighting as. It’s a little silly that dialogue always has to signal what color hair characters have now that Super Saiyans Blue and Rosé are included in the power tiers, but Toyotarou helps signal the shifts to Blue or Rosé with the style of energy emanating off of the characters. I also appreciate how clear Toyotarou makes the fight choreography. It’s always easy to tell how a kick was wound up or where characters have jumped around to and from, which is drastically important in such an action-packed manga. Where Toyotarou wields less restraint in his line art is in the background renderings. From ruined buildings with rubble detailed to the last little pebble to gorgeous, traditional Japanese style temples where gods dwell, the settings of Super are packed with things to look at behind the brawling Saiyans and bellowing deities. Overall, Dragon Ball Super Vol. 3 is a fun, action-packed read that fans of the series will enjoy from its charm to its building-leveling brawls. This installment ends at a point that feels a little like going back to where it started, so I’m looking forward to seeing where that backtracking will take the characters in the volumes to come! This volume features a super simplistic plot, but it has all the charm and personality Dragon Ball fans expect as well.